The Islamic Civilisation Park is the latest tourist attraction in Terengganu. It was officially opened by the Prime Minister YAB Dato' Seri Abdullah Haji Ahmad Badawi on Feb. 3, 2008. Located on Pulau Wan Man (Wan Man Island) in Kuala Terengganu, the 23-hectares Park is part of a project under the East Coast Economic Region (ECER) to further boost Kuala Terengganu as a waterfront city. Combining entertainment and education, the Park is expected to attract 1 million visitors during the Visit Terengganu Year 2008. The Islamic Civilisation Park is divided into two zones: the Islamic Civilisation Complex and the Public Zone. The Islamic Civilisation Complex features the first theme park that glorifies the achievements of Islamic architecture. When fully completed, the Park will feature 21 replicas of Islamic monuments and architecture from around the world. The main attractions of this theme park are five interactive monuments, namely Malaysia's National Mosque, the Dome of the Rock of Palestine, the Sacred Mosque of Saudi Arabia (Masjidil Haram), Al-Hambra Citadel of Spain and the Taj Mahal of India. At press time, a total of eight replicas have been fully completed. They are; the Kalyan Minaret of Uzbekistan, Abu Nasr Shrine of Afghanistan, Samarra Winding Minaret of Iraq, Mohd Ali Mosque of Cairo, Qairawan Great Mosque of Tunisia, Agadez Great Mosque of Nigeria, Aleppo Citadel of Syria, Kul Syarif Mosque of Russia and Minaret of Xian, China. However, only six replicas are available for distance viewing, which are the National Mosque of Malaysia, Kudus Minar Mosque of Indonesia, Pattani Central Mosque of Thailand, Sultan Omar Ali Saifuddin Mosque of Brunei, Taj Mahal of India and Minaret of Xian, China. All the other replicas are scheduled to be completed and available for viewing in May 2008. Meanwhile, the Public Zone houses the impressive Crystal Mosque – icon for the Islamic Civilisation Park and a new landmark for Kuala Terengganu. 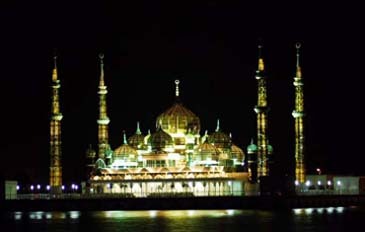 The unique mosque made of crystal shine glass and steel was officially opened by His Majesty Seri Paduka Baginda Yang di-Pertuan Agong Tuanku Mizan Zainal Abidin on 8 February 2008. The Public Zone also boasts the biggest convention centre in the east coast of peninsula Malaysia. It can seat up to 3,000 people at any one time. Regular shuttles from the city centre to the Park will be operational sometime in early April. Meanwhile, taxi services are available from the city centre to the Park. Alternatively, visitors can take the "Penambang" boat or a cruise boat from the Shahbandar Jetty to Tok Ku Paloh Jetty located in the Park itself. Situated on the east coast of Peninsular Malaysia, Terengganu borders with Kelantan on its north and Pahang in the south. The state has the longest coastline in the country with beautiful islands, where majority have been gazetted as Marine Parks. The state is characterized by a strong Malay culture, laid-back lifestyle, tranquil coastal towns and rustic villages. Other than pristine beaches and islands, the state is also home to the picturesque Kenyir Lake, the largest man-made lake in Southeast Asia. It is also noted for its traditional boat building activities, located at Pulau Duyong, where local craftsmen work from memory and without any blueprint to make beautifully handcrafted vessels.